I’m listening to “The Great San Bernardino Birthday Party” which runs into “Knott’s Berry Farm Molly,” a long guitar solo with many different movements, including segments in which the tape is played backwards. The first time I saw John Fahey, the opening act was a lighthearted bluegrass band, whose name now escapes me. And then John Fahey came out with his guitar. And he sat with his legs akimbo, and he set the guitar on the stage, and opened a can of Sprite. And he looked at no one in particular at the audience. And he drank from the can. And he looked with no particular interest at us again. And he drank more from the can. And he looked with indifference at the crowd. And he drank from the can. And the audience laughed. And he kept looking and drinking. And the audience laughed nervously. And he looked and gulped. And the audience tittered. And he looked and took a swig. And the audience didn’t know what to do. And when he finished the can of Sprite, he set the empty can down, and kind of clumsily and kind of slowly picked up his guitar, and we noticed, for the first time, it was a really big guitar, like bigger than you have ever seen, and dark, strangely dark. And he looked at us. And he struck a string, and a bottomless yawning cavern opened beneath our feet and below us streams of lava bubbled and stars flickered and the kind of radiance you cannot see erupted through us and the auditorium ceiling floated up and dispersed and swinging galaxies ululated overhead and deities above allowed themselves to be seen, and we were never again the same persons who bought tickets and sauntered down the sloping walkway into that concert hall. The second time I saw John Fahey, he was bombed out of his nut long before he ever hit the stage. And he stood up, and I swear to god, when he stood up, if he didn’t hold up those jeans below his bulging beer belly they would have fallen down. And, I don’t even remember why, but for some reason he thought the sound guy was messing with him. He stood up, his round belly puffing, and shouted, Common up here! You mother fucker! Get up from that mixing board. Common Sound Man. You wanna take me on! Common! Get up here! Oh god John, shut up sit down and play, you filthy drunk moronic fat slob. And nothing else, nowhere else, only here, only this, only everything, only everywhere, only nowhere, only nothing, only now. 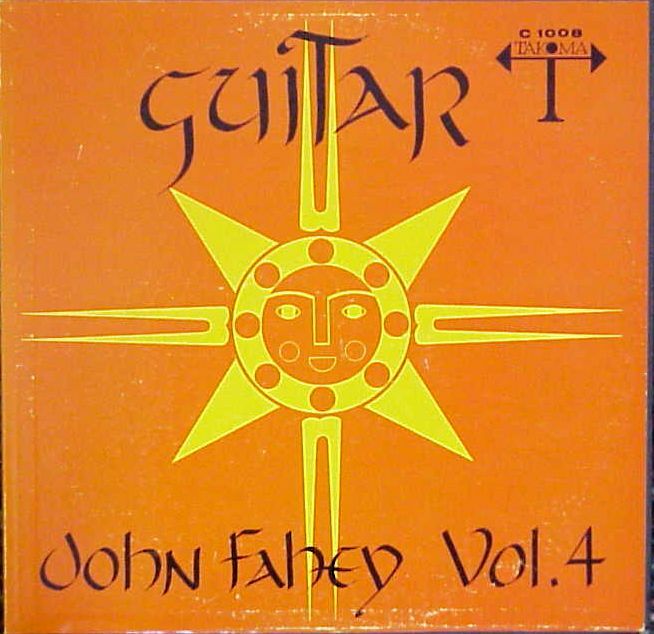 John Fahey, John Fahey Vol. 4, Takoma Records, C 1008 (1966). Album design: David Goines. Gary, I used to thrive making art listening to your show in Buffalo . .back in the mid to late 70’s . . . you were a treasure to uncover every night through morning. thanks after al these years!